Ladner-based BC & Alberta Guide Dogs, since 1996, has been raising and professionally training Guide Dogs for individuals who are blind/visually-impaired. The non-profit organization also offers Autism Support Dogs for children with moderate to profound autism aged 3-10 and their families. It takes two years and upwards of $35,000 to produce one certified dog, provided free of charge to the recipient. 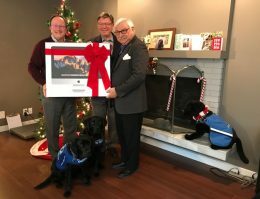 BC & Alberta Guide Dogs Chief Executive Officer Bill Thornton (left), with the help of two Guide Dogs in training, receive the new computer from Delta Foundation board directors (l to r) Peter Roaf and Guillermo Bustos.